Figure 1: B. thetaiotaomicron SusG. Cartoon representation of the crystal structure of the catalytically inactive SusG D498N mutant complexed with maltoheptaose (PDB 3K8L). The structure is colored blue to red from the N- to C-terminus. The CBM58, active site and surface starch binding site are labeled. The CBM58 occupies residues 216-335. Only a single CBM58 family member has been characterized, the founding member from the neopullulanase SusG of the human gut symbiont Bacteroides thetaiotaomicron (Figure 1) . The crystal structure of SusG featuring CBM58 revealed that this domain binds to maltoheptaose as well as acarbose, a pseudotetrasaccharide amylase inhibitor. Isothermal titration calorimetry with maltoheptaose and α-cyclodextrin as well as isotherm depletion assays with insoluble cornstarch further confirmed that CBM58 is a starch-specific CBM . Based upon these data, the CBM58 family is believed to bind exclusively to α1,4-linked glucan structures in starch. The crystal structure of CBM58 from SusG of B. thetaiotaomicron displays a canonical β-sandwich fold, with a single binding site accomodated by the loops connecting β3 and β4, β6 and β7, and β7 and β8 . These loops fold over one of the β-sheets. Because CBM58 recognizes internal regions of the polypeptide chain, it can be classified as a type B CBM . Like many starch-specific CBMs , the helical α-glucan is cradled by aromatic stacking interactions with two SusG CBM58 aromatic residues, W287 and W299, as well as hydrogen bonding interactions with K304, N330 and Y260 that aid in positioning the adjacent glucose residues that stack with the tryptophans . Figure 2: CBM58 sequence alignment. Amino acid sequence alignment from CLUSTALW (DNASTAR, Madison, WI). 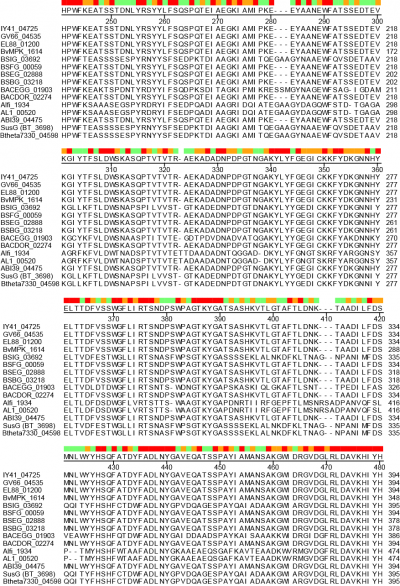 All protein names (left) refer to the locus tags of CBM58-containing GH13 enzymes as listed in the CAZy database. The numbering to the right refers to the amino acid position of each protein. For reference, the CBM58 of SusG (BT_3698) extends from residues 216-335.Red, orange and green colors at the top indicate positions of complete conservation, similarity, or more diverse sequence respectively. A unique facet of the CBM58 of SusG is its position in the middle of the GH13 amylase fold, occupying residues 216-335 of the protein. This domain is inserted between α3 and β3 of the catalytic B domain (residues 153-215 and 336-363), and essentially expands the typically small B domain of GH13 enzymes. Thus the entire SusG sequence can be described from N- to C-terminus (residue numbers): A domain (43-152) - B domain (153-215) - CBM58 (215-335) - B domain (336-363) - A domain (364-607) - C domain (608-692). In SusG, two short linker sequences from residues 212-217 and 334-338, spanning 12Å between the B domain and CBM58, have B-factors and an amino acid sequence that imply this domain is held in a fixed position . The CBM58 family is small, with the seminal members all arising from the Bacteroidetes phylum. This includes similar GH13 enzymes from isolates of Alistipes finegoldii, Alistipes shahii, Bacteroides dorei, Bacteroides eggerthii and Bacteroides vulgatus. A sequence alignment of 15 representative GH13 enzymes possessing a CBM58 reveals that the location of this domain is invariant as an extension of the B domain (Figure 2). The majority of these CBM58-containing proteins are expressed within canonical polysaccharide utilization loci [4, 5] of the Bacteroidetes that also encode homologs of the TonB-dependent transporter SusC and a homolog of the starch-binding protein SusD. CBM58 is only found within GH13 enzymes, and the conserved placement of the domain within the B. thetaiotaomicron SusG and like enzymes is unusual as it interrupts the fold of the catalytic domain. In the structure of SusG, the starch-binding face of CBM58 is located 45Å away and on the opposite face of the protein from the catalytic cleft . A mutant enzyme of SusG in which the CBM58 has been deleted retains catalytic activity against small substrates such as PNP-maltohexaose similar to the wild-type enzyme . The CBM-less SusG enzyme is 2-3 fold more active on autoclaved soluble starch such as maize amylopectin, but only retains ~30% of the wild-type activity on insoluble corn starch . B. thetaiotaomicron expressing only an allele for the CBM-less SusG grows the same as wild-type cells on autoclaved soluble starches . The CBM58 of SusG has been replaced with the Halo-tag® protein for single-molecule fluorescence imaging of the SusG protein in live B. thetaiotaomicron cultured on glucose and starch . In these experiments, the SusG-halo fusion partitioned between mobile and confined populations on the cell surface during growth on glucose and starch respectively, and the diffusion coefficient of the protein was measurably slower when interacting with starch granules, and in the presence of the other Sus surface proteins . The CBM58 domain was identified during the biochemical and structural characterization of SusG from B. thetaiotaomicron . The crystal structure of the GH13 enzyme SusG with maltoheptaose revealed an extended B domain, CBM58, that recognizes starch and maltooligosaccharides . This page was last edited on 6 March 2018, at 09:15.